In Zimbabwe, there is a well-developed mobile sector as the number of connections is 95% of the population. In combination with a rather high rate ($0.1 per minute), this opens up good prospects for profitable termination of VoIP traffic. It is important to choose a cost-effective tariff plan to make good money. In Zimbabwe, there are three cellular operators, among them the largest one is Econet. 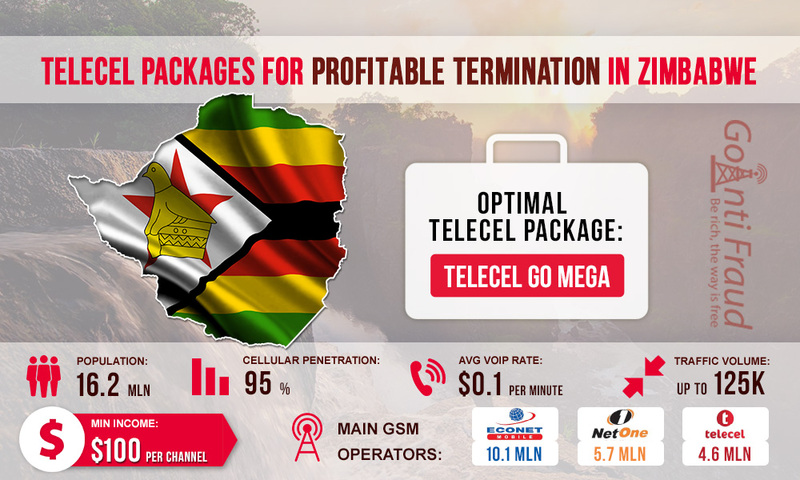 However, it offers quite high tariffs for calls, so NetOne and Telecel packages are more popular for termination. You can read about the optimal Telecel tariff plans here. Telecel is the third largest operator in the Zimbabwe market in terms of the number of connections. The subscriber base consists over 4.6 million users. Telecel offers one prepaid package - Telecel Go Mega. When you connect to it, one minute of the on-net call will cost you $0.16 but the tariff plan provides bonuses. For $10, you can order 120 free minutes. In addition, when you top up the account, 50% of the bonus minutes are given for on-net calls and to the numbers of other operators. If you are just starting your way in GSM termination - start it with GoAntiFraud! For beginners, we offer a complete NewBusiness solution that includes a set of necessary VoIP equipment and software for automation of business processes and proven tools to protect against AntiFraud systems. Over 2,000 customers in 31 countries have succeeded in the GSM termination using our service. You can become one of them! If you order 120 minutes to make on-net calls, you will need to pay $0.08 per minute. A Telecel SIM-card costs 50 cents. Accordingly, within a month you will be able to make about $100 via each channel of the dinstar colombia gateway. This package is optimal because you will use all the bonus minutes within a day, running the minimal risk of getting your SIM-cards locked. Nevertheless, there are cases when antifraud systems block the card within 2 hours after it has been activated. Therefore, we recommend to reliably protect your SIM-cards by simulating resourcefully the behavior of a real subscriber in the GSM network. Complete NewBusiness solution from GoAntiFraud is your successful start into the GSM termination! We provide ready-business on a turnkey basis, which includes a set of GoIP equipment by EjoinTech or ChinaSkyline, convenient software to computerize the operation and efficient tools to protect the SIM-cards from the lock. We also provide qualified technical support at every stage of your business. Our business model is based on the successful experience of more than 2,000 customers in 31 countries!